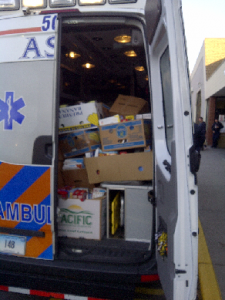 An ASM ambulance, loaded with food, nearing the full mark. MANCHESTER – When the dust settled on the friendly but competitive “Emergency of Hunger Food Drive,” Team Manchester won in the food count, Team Vernon won in cash, checks and gift cards and Team South Windsor won in turkeys. Over $33,000 in cash, checks and gift cards. The Ambulance Service of Manchester, in continuous operation since 1959, provides emergency medical services toManchester, East Hartford and several other towns in north centralConnecticut. In addition, ASM provides non-emergency transport throughout the greaterHartfordarea. ASM is locally owned and operated and is based onNew State Road in Manchester. This entry was posted in ASM Appearance in the Media or Press, ASM Company News, Community Relations Event, In the Hartford Courant, News/Press Release and tagged Emergency of Hunger, Food Drive, Hartford Courant, HVCC, Jesse Leavenworth, MACC Charities, Martha Marteney, The Reminder by ASM-Aetna. Bookmark the permalink.